The Full Moon in Libra on April 19, 2019 brings illumination as we arrive at a crossroads. We have a choice of which direction to follow, a choice of whose guidance to follow, a choice to push forward with ambitious initiative or to pause in contemplation, incubating recent insights before taking new action. The Libra Full Moon culminates at the final degree of the Scales, resulting in its waxing light building across the entirety of Libra as it forms a volatile square aspect with the lunar nodes as well as the shadowy conjunction of Saturn and Pluto. The Libra Full Moon will dramatically amplify chaotic forces of change already set in motion during the past week in which the fiery Sun in Aries also formed a disruptive square aspect with Saturn, Pluto, and the lunar nodes. Libra is a cardinal air sign of dynamic change oscillating between extremes that calls us to find balance in the center of its vortex, arranging elements of space and time as needed to find a sense of harmony within forces of discord. Fortunately, Jupiter in Sagittarius is in a harmonious sextile aspect with the lunation, with the retrograde motion of Jupiter prodding us to go within to cohere understanding. Once the Full Moon peaks at the final degree of Libra, its lunar light will illuminate the beginning of Scorpio and then apply immediately to an opposition with Uranus in Taurus. In addition, the day after the lunation on April 20 after the Sun enters Taurus it will immediately begin applying toward a conjunction with Uranus. The impact of the lunar opposition and solar union with Uranus can coincide with rapid acceleration of developments or propulsive inner forces making it feel like there is no choice but to take a certain action or approach to situations. As a result the more we can take time and space to center and find as much inner balance as possible, the better we can adjust to whatever becomes activated by Uranus in Taurus in the days following the peak of the lunation’s full light. Uranus in Taurus opposing the Moon and then conjoining the Sun can also correlate with innovative insights that suddenly lead to a solution to difficulties or to an ingenious idea to improve whatever we have been working on. The Libra Moon forming a square to the North Node of the Moon in Cancer and South Node of the Moon in Capricorn means that it is at its northern bending, its maximum peak of northern latitude within its orbital cycle. This is a dynamic point of volatile change in the Moon’s orbit in which it reaches its greatest height to then descend back toward the ecliptic where its orbit intersects with Earth’s orbit. Demetra George in her tome Ancient Astrology in Theory and Practice wrote that “the Moon at the bending suggests both a state of objective awareness between the lunar body and solar soul, but can also indicate the potential for disassociation and lack of connection” (p. 354). Dane Rudhyar in The Planetary and Lunar Nodes wrote that when the Moon forms a square with its own nodes its “lunar function operates with a minimum degree of focalization in earth-nature and in all bio-psychic organisms.” Rudhyar continued that since the Moon at its northern bending “is as far withdrawn from the Earth as she can be,” that the Moon is also “most active in her own sphere” (p. 23). Thus rather than impulsively rushing ahead with plans during the time around the Libra Full Moon, it can be best used to create protected personal space for reflecting upon one’s place within changing material circumstances. Listen to messages from the environment and the inner guidance you receive in moments of grace in order to adjust and make modifications as needed. Since Libra is the outwardly directed, airy home of Venus, it can also be a powerful time for creative brainstorming and experimenting with ways to further develop projects especially since Uranus in Taurus is involved in catalyzing the lunation’s force. Be open to looking at things from a completely different perspective, liberated from previous conceptions. Venus in Pisces rules the Libra Full Moon only a degree past her exact exaltation degree. Thus Venus in Pisces is on her throne of exaltation and capable of facilitating soothing self care and imaginative, inventive creativity in any art. Venus in Pisces is forming a quincunx aspect with the Libra Full Moon, suggesting the importance of finding ways to connect our creative ideas with the actual needs of our community. Rather than self centeredly focusing on whatever we think is the most interesting way to do things, instead bring the exalted status of Venus in Pisces into devising ways to make ideas helpful to others in practical ways that can make a difference. As we are also at the beginning of a new Venus and Neptune cycle, there could otherwise be a tendency for Venus in Pisces under a Libra Moon to put imagination into abstract conceptions that never fully materialize in reality. Venus leaves her exaltation of Pisces to enter Aries, the fiery home of Mars, the day after the Full Moon on April 20. Venus in Aries will be ruled by Mars in the swift air sign of Gemini, promoting creativity in arts and following wherever curiosity guides us. Unlike Pisces where Venus exalts, Aries is not comfortable zodiacal terrain for Venus to traverse in terms of indulging in the pleasures of Venus. Instead, the fire of Aries pushes Venus to claim and assert independence, take bold action in pursuit of desires, and find ways to bring people together over inspirational ideas that speak truth to power. Under the influence of Mars in Gemini, Venus in Aries will excel at multi-tasking and can wield its fire to cut through the multiple perspectives stirred up by Mars in Gemini in order to coalesce a direct creative expression. Casting an imposing shadow across the Libra Full Moon is the intensifying union between Saturn, Pluto, and the South Node of the Moon in Capricorn. Both Pluto and Saturn will station retrograde by the end of April, with Pluto stationing retrograde on April 24 and Saturn stationing retrograde on April 29. The south node of the Moon has already passed over Pluto and will be forming a conjunction with Saturn as it stations retrograde at the end of April. When planets station, their significations saturate the astrological landscape: thus Pluto in particular is looming large over the Libra Full Moon. Rick Tarnas in Cosmos and Psyche linked the archetypal impact of Pluto in mundane events with the mythic archetype of Dionysus, as it carries an eruptive life force that cannot be resisted, shattering and loosening structures and beliefs that had been bringing a sense of security. When Pluto erupts from the depths, transmutation is in process and as new forms arise and old forms break apart, we need to allow ourselves to also let go of the way things have been in order to reorient with the changing forces taking shape. The union of Pluto, Saturn, and the South Node of Capricorn is particularly challenging due to the emphasis Capricorn has on the ancient, the traditional, the structures and beliefs that have endured across time and the figures who have gathered strength and skill through a wealth of experience. On the one hand we need to recover and cultivate the aspects of our myriad civilizations that bring stability and order in ways that meet the needs of people, yet on the other hand numerous aspects of the old order also must now break down or decay in order to begin clearing space for new forms and structures to take shape. The tragedy of the Notre Dame cathedral catching fire in Paris reveals how gut wrenching the structural regeneration underway will be for those emotionally and spiritually invested in forms now breaking apart. Saturn and Pluto will not form their exact conjunction until January 12, 2020 but with both of them stationing at the end of April only three degrees apart, while simultaneously conjoining the transiting South Node of the Moon in Capricorn, the end of April and beginning of May will bring an amplified initiation into the meaning of their new cycle. Making it more intense is that the heliocentric south nodes of Saturn and Pluto are in the same area of Capricorn, meaning that the movement of Saturn and Pluto around their entire orbital arc is now descending to intersect with the orbit of our Earth around the Sun. Dane Rudhyar likened this type of archetypal process we are experiencing with Saturn and Pluto to both the death and decay of the Autumn season, as well as the importance of incubating and gestating the seed that will bring forth new life. There is a sacrifice necessary, a release of what must die in order to bring forth what needs to be born. We simultaneously will be experiencing the extremes of Saturn and Pluto, the putrefaction of their poisonous toxicity as well as the empowering discipline and reordering of their more ideal significations. The Libra Full Moon also brings illumination to the recent ingress of Mercury into Aries. Mercury had been in Pisces since February 10 before finally entering Aries on April 17. At the time of the Full Moon, Mercury is applying to a close conjunction with Chiron in Aries and is applying toward a mutually receptive sextile aspect with Mars in Gemini. In the past month we have had a lot happening in the signs of Pisces and Capricorn, inwardly directed signs that tend to work receptively with material at a patient pace more so than with frenetic speed. Mercury in Aries combined with Mars in Gemini will speed up events and facilitate taking direct, impactful action to shape matters that have become volatilized and ready to change. Mercury in Aries is firmly within its Morning Star phase in which it heralds the rising Sun at dawn with its light. Mercury’s Morning Star phase resonates with being curious and explorative, reaching out for new connections and weaving new meaning and ideas together. Dane Rudhyar called this phase Promethean due to its strong capacity for foresight, and I also think of it in relation to the Magician arcanum in tarot due to its capacity for helping us reshape matters in line with our developing vision. Whatever shifts occurred for you during the long Mercury retrograde in Pisces transit that lasted through March, it is now time to integrate the lessons into your daily communication and movement through your community. Mercury will form its exact sextile with Mars in Gemini on April 30, and so their mutually receptive relationship bears gifts to infuse into research, communication, promotion, and mercantile activities for the rest of April. As the Moon continues to wane in light for the rest of April, Mercury will get closer each day to forming a volatile square aspect with Saturn, Pluto, and the transiting lunar nodes at the same time that Saturn and Pluto are stationing retrograde. Simultaneously, Mars in Gemini will be getting closer each day to forming a catalytic square aspect with Neptune in Pisces, becoming exact on April 27. This brings a much deeper, ineffable influence into the receptive relationship between Mercury and Mars. Mercury in Aries forming a square with Saturn, Pluto, and the lunar nodes will penetrate awareness into unconscious material and patterns, as well as insight into the larger structural changes occurring in society. Though Mars and Mercury will want to incite action and swiftness, it will be important to make time and space to recenter in reflection, listening within to unconscious messages that can bring guidance. The influence of Mars forming a square with Neptune can bring inflation and fixation on dogmatic perspectives in some people, while for others this same influence could help unveil illusions that have been operating under the surface of perception. The Full Moon in Libra culminates in the third decan of Libra associated with the Four of Swords card illustrated by Pamela Colman Smith. In the image above we see what looks to be a knight in prayer, or perhaps a sarcophagus, under a stained glass window of “PAX” or “peace.” This image also evokes a pilgrim in meditative silence within a protected, sacred space, and likewise it can help us find our own balance at this time if we can manage to create our own space for solace in silence. 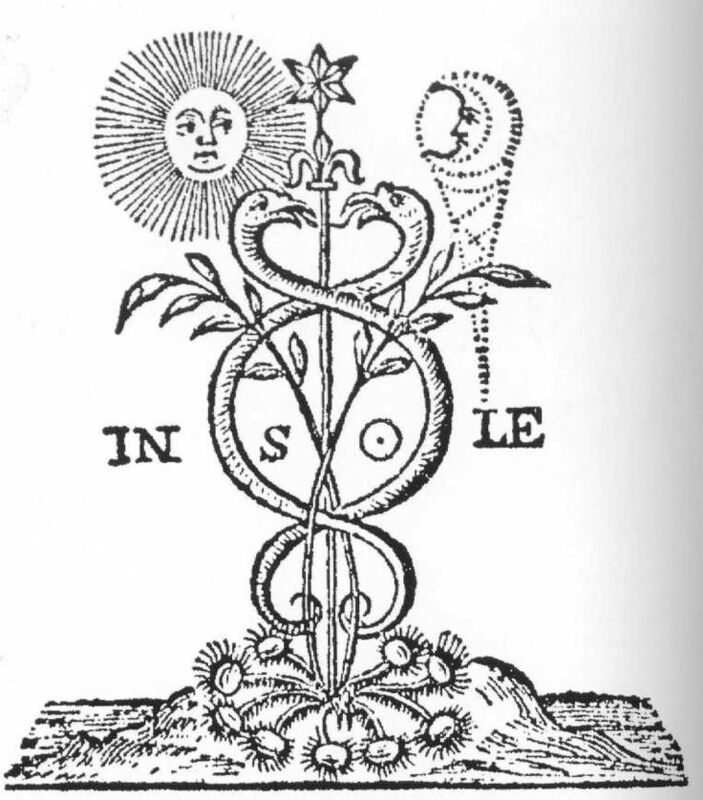 Johannes Fiebig and Evelin Burger in their book on the tarot noted symbols in the image that contrast “inner and outer issues, the abstract world and daily life, perfect ideals and limited reality.” Within the balance of these dualities, we can sense how the figure’s positioning is like a re-balancing of our body and mind, the sword below the figure a tool to cut away the false in order to reveal our essential and genuine presence that can emerge now. The Hellenistic text the 36 Airs linked Nemesis to the third face of Libra. Austin Coppock in 36 Faces linked the presence of Nemesis in this decan to her role as “a force which restored balance to life’s chaotic wheel,” acting “to consciously correct the injustices whirl of blind forces” by “restoring right proportion.” One way Nemesis restores balance is through bringing retribution against those carried away by hubris who arrogantly act out of balance with natural forces of change. Her presence with the Libra Full Moon emphasizes the need to rebalance whatever has become out of proportion in our life. We may recognize aspects of our shadow we have been denying, or realize we have been suppressing desires that need to be accepted and cultivated. There are many crises coinciding in collective events calling for action, but in addition to playing a role in creating the change we wish to see in external events, we likewise need to bring attention to tend to the changes occurring internally. Her magnificence unfurled from a darkly clouded horizon, the radiant light laid bare in the rising of the Full Moon heralds insight and illumination every month when Luna reaches the peak of her cycle. Yet the Full Moon in Aries on October 15 or 16 (depending upon your location) will electrify thoughts and feelings beyond the norm as it is united with Uranus and is also a perceptually larger “Super Moon.” Super Moons were defined by astrologer Richard Nolle as New or Full Moons within 90% of the Moon’s closest orbit to Earth, and besides being simply bigger in the sky they have also been found to impact tides more dramatically. Events speed up in alignment with this dramatic lunation, and since Uranus awakens with a jolt, there will be no hiding from whatever is unleashed. Any aspect of our life in which we have been asleep, unmindful, or in denial will receive an accordingly large dose of revelation. September was full of intense astrological transits dredging up buried material: two potent eclipses intertwined with Mercury retrograde in Virgo, and the final exact square between Saturn and Neptune that had been building over the past year. There is deep-rooted force from Mars united with Pluto underneath the swift flames of this lunation that brings catharsis and power to face arising challenges with accountability. The Full Moon aligned with Uranus is a breakthrough marker on our astrological calendar that ushers us into a time period in which Jupiter, Saturn, and Uranus will be in a relationship enabling rapid growth and development. The end of 2015 and first three quarters of 2016 were dominated by a square between Jupiter and Saturn, a square between Neptune and Saturn, and Uranus in Aries being generally isolated to Jupiter while in a sign based trine with Saturn in Sagittarius. Jupiter and Saturn are important to always consider in tandem, as Jupiter expands growth within the form and structures dictated by Saturn. As a result, this past year involved deconstruction and falling apart of old relationships and supports, with mixed results in the attempt to reorient life in a more enlivening and authentic direction. Uranus is the planet that can explode the boundaries of Saturn in order to facilitate the vision of Jupiter moving beyond previous limitations. As Jupiter in Libra forms a sextile to Saturn in Sagittarius with reception, and Saturn begins to slowly move toward an exact trine with Uranus that will come at the end of 2016, the containment of Saturn is energized with mutable activation opening portals to perception of how to manifest emboldened vision free of past limitations. Those who have strong aspects of Uranus to planets in their birth chart are familiar with the necessity of working with the nonlinear field of Uranus that has commonly been likened to the dispersion of energy released from a strike of lightning in a thunderstorm. This doesn’t necessarily make this lunation easier for those who live everyday with a hard aspect between Uranus and their Moon, Mercury or Venus, but it does mean that whatever coping skills you have developed in relation to dealing with Uranus strikes will be helpful. Uranus can throw one off kilter into rebellious, freedom seeking behavior that is not in our best interest or the highest good, and so with Uranus it is beneficial to find outlets of release to actively engage with and transmit its primal vibrations. For example, pouring energy into a collective cause/movement you feel passionate about, discharging tension through vigorous exercise or balancing movement, focusing one’s energy into development of a project, creation of art or music, or cultivation of personal writing are some ways to let Uranus move through you into something productive you care about. The Full Moon is also united with the mysterious dwarf planet Eris which befitting its moniker creates discord in astrology as not only did its discovery lead to the demotion of Pluto from its planetary status, but many astrologers are in disagreement over whether or not the meaning of Eris can be, or even should be, understood in astrology at this stage. Since Uranus has been co-present with Eris in Aries for years, and now is in almost exact conjunction, the one thing that is clear is that whatever meaning Eris has is merged with the meaning of Uranus in this period. One thing we do know is that the eccentric orbit of Eris goes beyond Pluto and at a point crosses in between the space separating Pluto and Neptune, approaching the orbit of Neptune before once again moving beyond the orbit of Pluto. It’s orbit is incredibly inclined compared to the other planets we use in astrology, so much so that it passes through only a few of the traditional zodiac constellations (it is now passing through Cetus the sea monster). In my own work in looking into Eris, similar to other astrologers I have noticed those with exact aspects of Eris in their chart often disrupting the consensus of a familial or mainstream cultural context, becoming individuals driven to break out of old paradigms that have dominated belief systems. We could view Eris aligned with Uranus and the Full Moon as reflecting a tidal wave of pattern breaking force. Mars in its exaltation of Capricorn rules the Full Moon while applying closely to a conjunction with Pluto. This is the close of the cycle between Mars and Pluto that began on 10 November 2014, and in the distillation of its building intensity our most compelling desires rise to surface awareness. We can simultaneously feel ambitious while also sensing acutely the power dynamics surrounding us and anywhere we have been losing our self-authority in relation to another. The blowout quality of this Aries Full Moon requires taking the responsibility to be assertive in pursuit of desires while being fully accountable for our behavior in the process of developing needed structures and relationships for support. The most fruitful way to navigate will be through cultivating mutual respect and cooperation in relationship with whomever we feel a healthy draw to engage with. The relationships in which we are out of balance in toxic or unhealthy ways will become obvious and feel intolerable to continue giving energy to. Mars in Capricorn facilitates being cool and resolute enough to sever ties where needed, while also being receptive and energized to collaborate with those of shared resonance and purpose. The past lunation cycle has re-connected the Pluto Uranus square that dominated the astrological climate from 2011 – 2015, as during the waxing of the Moon the Sun in Libra passed through a square with Pluto into an opposition with Uranus in the culmination of the Aries Full Moon. While Uranus can be liberating, the unconscious realm activated by Uranus can lead us into scenes in which we must face choices mirroring past repetitive patterns. The liberating potential Uranus brings is through actively breaking free of our old mindset to make a radically empowering choice. Issues that have held us back in one way or another in recent years may emerge again in the full light of the Moon, creating opportunities for new responses and wholistic understanding. Mercury in Libra is barely beginning to separate from a square to Pluto in Capricorn at the time of the Full Moon, and is one of the most exact aspects of the lunation. In the week leading up to the Full Moon, Mercury completed the final of three exact conjunctions it has formed with Jupiter since the period of Mercury going retrograde in Virgo in September, an unusual amount of unions between Mercury and Jupiter to experience. Mercury then moved into a square with Mars before entering its square with Pluto at the peak of this potent lunar cycle. Mercury as a result is at the “crisis in consciousness” point of the last quarter square in relation to both Mars and Pluto as it begins a new cycle with Jupiter. Our Mercurial perception is shedding and emptying itself from old beliefs and conditioning we are not aligned with. In the space opened up there is vital re-visioning available that will guide us toward relationships and experiences more essentially resonant. Collective events have featured ugly discourse recently, as well as continued important exposure of individuals facing oppression within the power dynamics of society. The union of Venus, Juno, and Black Moon Lilith in Scorpio in the build up to these intense Mercurial aspects added visceral emotional power to revelations of injustices. Reflecting upon how we have been wronged by others and how we have wronged others, and any other messages unveiling whatever has been out of balance makes it possible for profound reorientation toward embodying a more receptive presence in relationship. Dealing with others fixated on bigoted and biased perspectives is also more excruciating under these hard Mercurial aspects, yet the lesson seems to be about how to remain in one’s own integrity while being confronted by perspectives antithetical and offensive to one’s own viewpoint. Mercury is combust for most of the waning cycle of this Moon cycle, becoming purified under the rays of the Sun until it reaches cazimi at the heart of the Sun on 27 October a few days before the New Moon in Scorpio on 30 October. The insights gained into our relationship patterns can be used to burn off whatever needs to be released as Mercury heads into a union with the Sun in the week and a half following the Full Moon. Saturn in Sagittarius continues to be in square to the lunar nodes at the Full Moon, focusing attention on Saturn being in a harmonious sextile with both Mercury and Jupiter in Libra. While Mercury formed its exact sextile with Saturn during the Moon waxing full this cycle, during the ensuing waning of the Moon the sextile between Saturn and Jupiter will slowly build in strength. The structural walls of Saturn are now more receptive and open to mutating, and the union of the Full Moon and Uranus in a whole sign trine to Saturn signifies that outdated forms can now be torn down in order to erect edifices that are more attuned to internal shifts of meaning and purpose. Significantly during the realization of meaning as the Moon begins to wane into its disseminating phase a couple of days after the Full Moon, Venus will enter Sagittarius. Once Venus enters Sagittarius it will begin to form a mutually receptive sextile with Jupiter in Libra capable of imbibing developing forms with one’s arising sense of pleasure and aesthetics. Take advantage of this building sextile between Venus and Jupiter from October 18 – 26, 2016. In addition to her mutually receptive sextile with Jupiter, Venus will also begin to apply to a conjunction with Saturn in Sagittarius in the waning cycle of the Moon. Venus will form an exact conjunction with Saturn at a Dark Moon in Scorpio at the end of October, and will be at the beginning of a new cycle with Saturn at the New Moon in Scorpio on 30 October. The shift of Venus from the slowly churning waters of Scorpio into the leaping fires of Sagittarius as a result will mean the galloping pace of Venus in Sagittarius will be somewhat restrained due to the impending encounter with Saturn. This can be a period of serious commitment to all things Venusian, bringing love and joy to the cold realm of Saturn. In addition, as Venus forms her mutually receptive sextile with Jupiter and approaches her conjunction with Saturn, her aesthetic senses will be altered by a square to the otherworldly Neptune in Pisces. These aspects appear to be fantastic to apply to any creative process involving imagination. The Full Moon falls in the third face of Aries associated with the Four of Wands card illustrated above by Pamela Colman Smith. In the image we find two figures hoisting fragrant flowers in celebration under a garland within a container of four sturdy rods, with the protective structure of a castle in the background. Venus rules the third face of Aries and possesses dynamic charisma in this fiery decan. 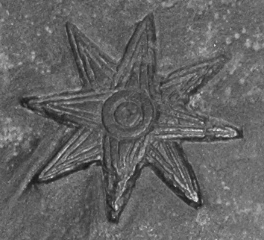 Indeed, Austin Coppock in his book 36 Faces noted that Eros was bound to this decan in the fragmentary Hellenistic text The 36 Airs of the Zodiac. Coppock ascribed the image of “The Burning Rose” to this face as it holds “the power of the spirit to unify and seduce, to motivate and to bond those of confluent passions” (p. 64). Coppock discerned that we find in the final decan of Aries “the power of art to overcome hostility,” such as the ability of a performer to transcend discord through a heartfelt performance that inspires and arouses the passions of an audience. Yet Coppock also cautioned that while the torrid potency found in the third face of Aries can bring union even in the most difficult circumstances, attention must be given to sustaining the flame of connection with less volatility so that it may last. Integrating the meaning of the third face of Aries holding the union of the Full Moon with Uranus, there is incredible potency available to performers of all arts to beguile and enchant. Venus is in the third face of Scorpio, which happens to be another one of the decans of the zodiac ruled by Venus. This means that while Venus is not in the same face as the Full Moon, Venus nonetheless possesses the dignity of face that enables her to achieve success despite being in the sign opposite her home of Taurus. As previously mentioned, there is an electrical field found in the light of the Aries Full Moon that can be transmitted into dynamic performance or any creative process. In the light of the glowing Moon, open awareness to whatever brings inspiration and joy and find ways to share your passion so as to uplift others of resonant accord.